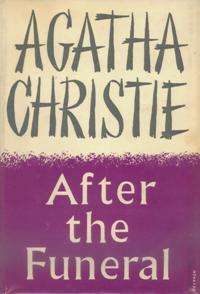 After the Funeral is a work of detective fiction by Agatha Christie and first published in the US by Dodd, Mead and Company in March 1953 under the title of Funerals are Fatal and in UK by the Collins Crime Club on 18 May of the same year under Christie's original title. The US edition retailed at $2.50 and the UK edition at ten shillings and sixpence (10/6). A 1963 UK paperback issued by Fontana Books changed the title to Murder at the Gallop to tie in with the film version. 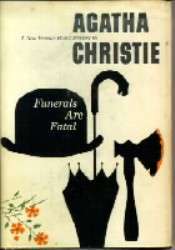 The book features the author's Belgian detective Hercule Poirot, but the Murder at the Gallop film adaptation instead featured her amateur sleuth, Miss Marple. A wealthy man dies at home. His relatives gather after his funeral for the reading of his will, during which his sister states that he was murdered. The next day, she is found murdered. Poirot is called in to solve the mystery. After the funeral of the wealthy Richard Abernethie, his relatives assemble for the reading of the will at Enderby Hall. The death was not unexpected and of natural causes. Nevertheless, Mrs Cora Lansquenet, says, "It's been hushed up very nicely ... but he was murdered, wasn't he?" The family lawyer, Mr Entwhistle, begins to investigate. Mr Entwhistle relates the outline of the will to the relatives. As Richard's wife and child died before he did, his possessions are divided among his two living siblings and the widow or children of those who died before him. His brother Timothy and sister Cora Lansquenet were alive when he wrote the will. Brothers Leo and Gordon were killed in the war. Richard has a nephew and two nieces, the sum total of the next generation. He spent time with his nephew George, and his nieces Susan and Rosamund and their husbands, Leo's widow Helen, Timothy, and Cora. He split his wealth in six portions. Enderby Hall is to be sold. The next day, Cora Lansquenet is murdered in her sleep at her home by repeated blows with a hatchet. The motive is not obvious. Her life income reverts to Richard's estate. Miss Gilchrist, Cora's companion, thinks it is because Richard was poisoned, as Cora told her. Miss Gilchrist gains nothing from Cora's death except Cora's own paintings. Entwhistle calls on his friend, Hercule Poirot, to resolve doubts about the death of Richard. Poirot employs an old friend, Mr Goby, to investigate the family. Goby rapidly turns up a number of reasons for family members desperate for the money in Richard's estate. Goby employs all sorts of clever methods to uncover the most private information, using agents who pose as actors, lawyers or Catholic nuns. None of the family members can be cleared of suspicion. Cora Lansquenet was an artist and collector of paintings from local sales. Niece Susan Banks, heir of Cora's property, goes to her cottage to clear up the possessions and prepare them for auction, on the day of the inquest into Cora's murder. Miss Gilchrist's claims that Cora always painted from life, yet Susan finds one quite recent painting featuring a pier that was destroyed in the war. The next day, after Cora's funeral, art critic Alexander Guthrie, arrives to look through Mrs Lansquenet's recent purchases as previously scheduled. He finds nothing of any value there. That evening, Miss Gilchrist is poisoned by arsenic in a slice of wedding cake apparently sent to her through the post. She ate just a small portion of it, which saved her. Inspector Morton investigates the Lansquenet murder along with Poirot. Poirot joins the family as they gather to look over and select items of interest before the estate auction. Timothy Abernethie, his wife Maude, and Miss Gilchrist, who is now assisting them, come to Enderby. Poirot briefly poses as Monsieur Pontalier but Rosamund uncovers his guise the first evening. Helen Abernethie telephones Entwhistle early the next morning with the news that she has realised what struck her odd the day of the funeral. Before she can say more, she is savagely struck on the head. Helen is safely away to recover from her concussion. Inspector Morton asks each family member to account for themselves on the day of Cora Lansquenet's murder. Cora had not come to the funeral at all. It was Miss Gilchrist in disguise, as part of a plot for her own gain, leaving Cora home asleep from a sedative in her tea. Miss Gilchrist planted the idea that Richard Abernethie's death had been a murder - when Cora is murdered, it would seem that Richard's alleged murderer had killed Cora to silence her. None of the family had seen Cora for more than two decades, due to the ill feeling at the time of her marriage. Miss Gilchrist copied her mannerisms and the only flaw in her portrayal was spotted by Helen Abernethie - Miss Gilchrist had rehearsed a characteristic turn of the head in a mirror, where the reflection is a reverse of reality; when she came to the house after the funeral, she turned her head to the left, not the right. After a timely conversation among the young cousins, Helen realises this difference. Miss Gilchrist gave herself away to Poirot by referring to the wax flowers on the green malachite table the first day the relatives gathered to select objects before the auction: these were on display on the day of the reading of Richard Abernethie's will but removed by the time Miss Gilchrist, as herself, visited Enderby Hall. She had deliberately poisoned herself with the arsenic-laced wedding cake to evade suspicion and appear yet another potential victim, which aroused suspicions. Miss Gilchrist recognised a painting by Vermeer in Cora's purchases, but Cora did not recognize it. Mr Guthrie would have seen the painting's value, so Miss Gilchrist made her plan of murder. Miss Gilchrist covered the Vermeer with her own painting of the destroyed pier. The scent of the oils lingered when Mr Entwhistle visited the cottage the day after the murder. Miss Gilchrist's dream was to rebuild her beloved tea shop with funds raised on the Vermeer. Poirot deduced the key role of the painting. It was sent to Guthrie, who replied tersely, "definitely a Vermeer, Guthrie." Inspector Morton added that two nuns had called at Cora's cottage the day of Richard Abernethie's funeral. No one answered, yet they heard noises from a person, witnessing the real Cora Lansquenet's presence in her own home as Miss Gilchrist was impersonating her at Enderby Hall. Once accused, Miss Gilchrist breaks down in a flood of complaints of the hardships of her life and fantasies about a new teashop. She goes quietly with Inspector Morton. Thus Poirot answered the question Mr Entwhistle hired him to resolve, and untangled the mystery of Cora's death. Miss Gilchrist is found guilty at trial. In her time in prison during legal proceedings, she is quickly becoming insane, planning one tea shop after another. Mr Entwhistle and Hercule Poirot suspect her punishment might be served in Broadmoor, but have no doubt she had plotted and carried out the cold blooded murder in full possession of her faculties – this ladylike murderer. Unlike in Taken at the Flood, in which there is a strong sense of post-war English society re-forming along the lines of the "status quo ante", After the Funeral is deeply pessimistic about the social impact of war. The village post office no longer handles the local post. Mr Goby blames the government for the poor standard of investigators that he is able to employ. The family mansion must be sold, and the butler Lanscombe, who had expected to be able to retire to the North Lodge, is forced to leave the estate. A pier on a postcard has been bombed and not yet rebuilt, which desolate fact is pivotal to the plot. Richard Abernethie is devastated that his only son died abruptly from polio, an epidemic of that time. The son was fit, healthy, about to marry, and then gone. Richard sees no other single heir worthy of succeeding to his estate entire. The Abernethie drive and talent for business are found in his niece Susan, but he cannot consider her as sole heir because she is female. Rather, he reacts to her by being disappointed in her husband. Not finding any one person to take over his fortune and business, he divides the money among family members who seem likely to waste it on gambling and theatrical ventures. One person he valued was his sister-in-law, now widowed by the war. She had a child in a war time affair. She never told Richard of the child, aware of his Victorian views, telling others she has a nephew she helps. She is grateful for his kindness in including her in his will, as she can now raise her son on faraway Cyprus with a proper education. The child is loved, but his mother feels he cannot be accepted in post war England. The last name chosen for Cora's husband, the much disliked painter with some claim to being French, is Lansquenet. It is unusual as a last name, as mentioned in the story. The word is the name of a card game, but mainly it is the term for a German mercenary, a foot soldier with a lance, from the 15th and 16th centuries. Food rationing in England came to an end in the year of publication, but its effect is still felt in the egg shortages that are mentioned in the novel. Throughout, there is a strong sense of the hardships of the post-war period, including the conniving Miss Gilchrist's heartache at losing her cherished teashop due to food shortages, and being forced into a life of dependence, in which she is regarded as little more than a servant. There are also comments on the increased burden of taxation associated with Clement Attlee's government. In chapter 12, Poirot mentions the case handled in Lord Edgware Dies as being one in which he was "nearly defeated". In Chapter 13, Poirot's valet is referred to in the narrative as Georges. His actual name is George, but Poirot always addresses him directly as Georges. This is the first (and only?) time that he is referred to by the French version in narration. This is the first of the Poirot novels in which lesbianism (between a woman and her companion) is discussed as a possible motive. The references are veiled and euphemistic: Inspector Morton calls it "feverish feminine friendship" in chapter 13. In 1963, a film adaptation entitled Murder at the Gallop was released by MGM. However, this version replaced Poirot with the character of Miss Marple, played by Margaret Rutherford. On 26 March 2006, an adaptation of the novel was broadcast on ITV with David Suchet as Poirot in the series Agatha Christie's Poirot. The cast included Michael Fassbender as George, Geraldine James as Helen Abernethie, Lucy Punch as Susan, Robert Bathurst as Gilbert Entwhistle, Anna Calder-Marshall as Maude, Fiona Glascott as Rosamund, and Monica Dolan as Miss Gilchrist. Cora is the divorced wife of an Italian artist named Gallaccio, whose surname she kept. Gallaccio replaces the character of Mr. Guthrie as the art expert that Poirot relies upon. The painting revealed at the end is a Rembrandt instead of a Vermeer. Entwhistle does not investigate following the funeral and will reading, but after Cora's death, though in a minor capacity. The character of Mr Goby is omitted. Poirot appears solely under his own name, and interviews the family members himself. Timothy's ability to walk is only shown at the end, unlike in the book where it is known from the start, while Maude is presented as slightly foolish and participates in a flirtation with Gallaccio. Susan is unmarried, and devoted to missionary works in Africa (specifically, Bechuanaland). George is Helen's son, Richard's favored nephew, and expected heir to the bulk of the estate. He is carrying on a secret romance with Susan; on the day after the funeral they had a secret tryst in Lytchett St Mary. Also, Richard was George's real father: Richard had told him this, but George rejected it. George quarreled violently with Richard (which Poirot and Entwhistle learn from Lanscombe). George even forged a will for Richard, disinheriting himself in favor of the other relatives. As in several other episodes, the time has been changed to the 1930s - in this case, from the post-World War II years. The pier in the painting found by Susan was destroyed by a fire, not the war. Miss Gilchrist lost her tea-shop due to a Lyons tea-house opening nearby, not due to wartime rationing. When Miss Gilchrist is arrested and taken away, she pauses to repeat her imitation of Cora. Poirot hints she likely will be committed for insanity. There is no further discussion. BBC Radio 4 adapted After the Funeral for radio, featuring John Moffatt as Poirot with Frank Thornton as Mr. Entwistle. The novel was first serialised in the US in the Chicago Tribune in forty-seven parts from Tuesday, 20 January to Saturday, 14 March 1953. In the UK the novel was first serialised in the weekly magazine John Bull in seven abridged instalments from 21 March (Volume 93, Number 2438) to 2 May 1953 (Volume 93, Number 2444) with illustrations by William Little. ↑ Genealogy of the surname "Lansquenet"